Here are the top six picks to bring you back your favourites this spring. ibd Just Gel Polish Spring Revival Collection consists of 6 beautifully uplifting shades to get you ready for the warmer season. Just Gel Polish gives fabulous nails in a flash! Gels cure under UV lamp (9+ watts) in 2 minutes and in an LED lamp in just 30 seconds. Gorgeous nails that last and soak off in 10 minutes. Sheet masks are one of the most effective delivery systems of nutrients to the skin, helping to repair damaged skin cells whilst simultaneously promoting the growth of new healthy cells. Formulated and laboratory tested by dermatologists, Skin Republic is hypoallergenic. The Skin Republic range features sheet masks for the face, hands and feet. Poise, Finesse, Strength & Beauty. The Cuccio Colour Ballerina Collection is the perfect combination of soft, elegant and subtle shades that embody the grace of classical ballet, Available in Veneer LED/UV Colour & matching Lacquer. 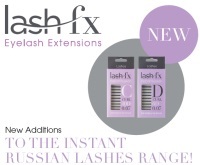 Posted in Uncategorized	| Comments Off on Lash FX NEW Additions -To The Instant Russian Lashes Range! The Edge Chrome Polish Instructions. Using the applicator, rub the chrome powder into the nails. You will need at least 2 layers of chrome powder. Rub well until you have a mirror finish. Apply non-wipe hi-shine top coat and cure. The Edge recommend product 2003060. Apply bonder and base as normal and cure. Apply top coat and cure. Wipe away sticky residue with a DRY lint-free wipe. Apply chrome powder thoroughly, using circular motion to rub in. Remove or rub in any excess powder. Seal with 1 to 2 further layers of top coat. Cure and remove sticky residue with prep and wipe. Posted in Uncategorized	| Comments Off on The Edge Chrome Polish Instructions. NEW! Solglo Tanning Mist is a spray tan in a can! Enriched with vitamin e & aloe vera to help repair and soften skin without making the skin feel oily or sticky. Fragranced with a deliciously light coconut scent, the Solglo Tanning Mist will transport you to a relaxing sandy white beach next to the crystal clear ocean covered in coconut palm trees. Available in both Sun Kissed and Sun Drenched 160ml, 100% animal cruelty and vegan friendly.